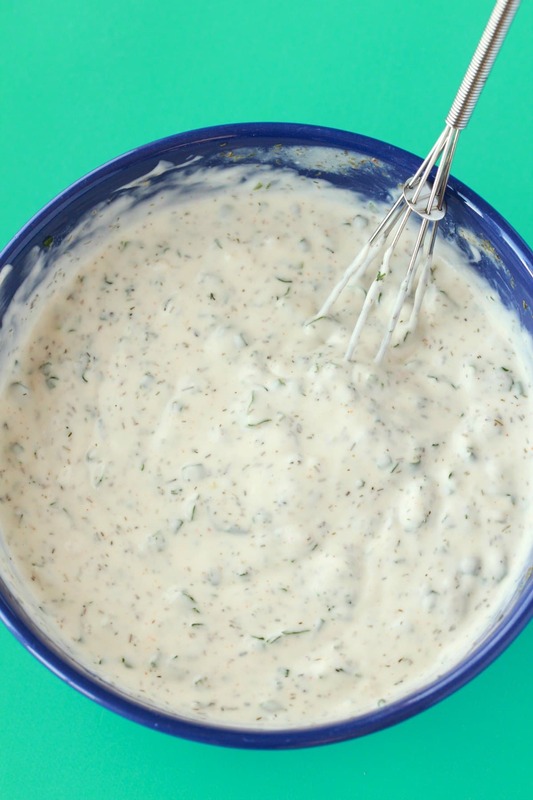 Super simple 10-ingredient vegan ranch dressing that really delivers on flavor. 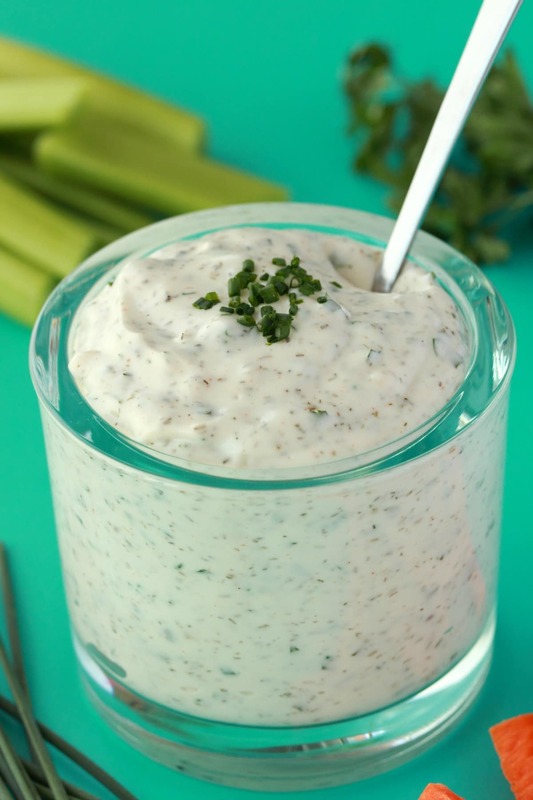 Ultra creamy and totally divine as a dressing or dip. 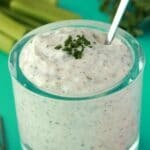 I was soooo thrilled with this vegan ranch dressing! 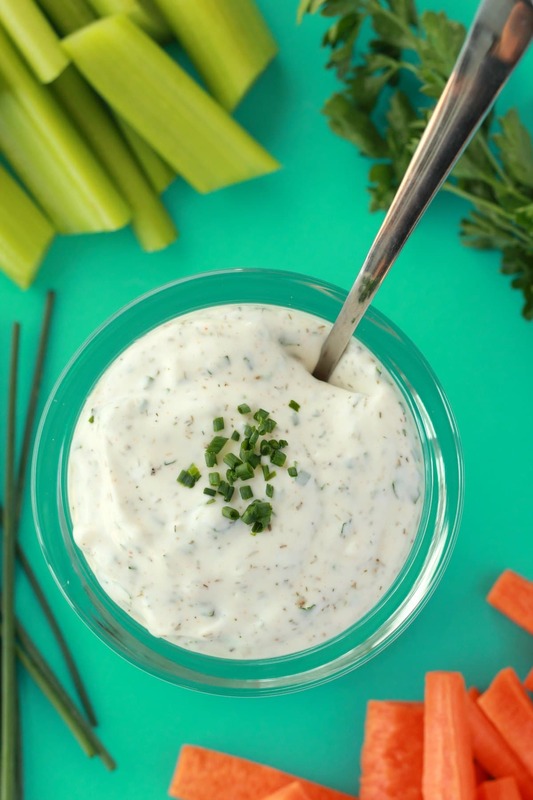 It turned a simple snack of carrot and celery sticks into a gourmet treat! In fact after tucking into those it awakened a serious desire for some (ever so slightly) less healthy potato chips that I sent Jaye off to the store to get because the ranch dressing was so good that I wanted to eat ALL of the rest of it with some potato chips! So whether you’re going to eat it with carrot and celery sticks or potato chips or pour it over salad, you’re just going to love it, that I am very sure about! 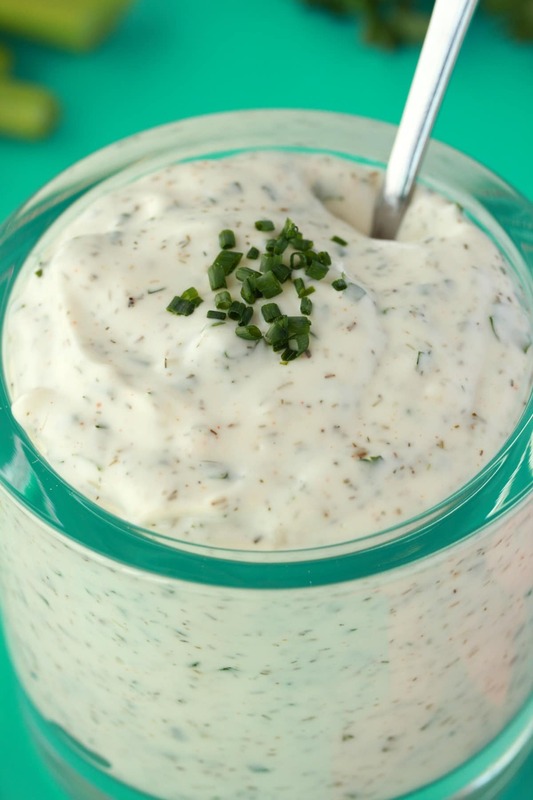 A classic ranch dressing uses mayonnaise, buttermilk and fresh herbs and flavorings. 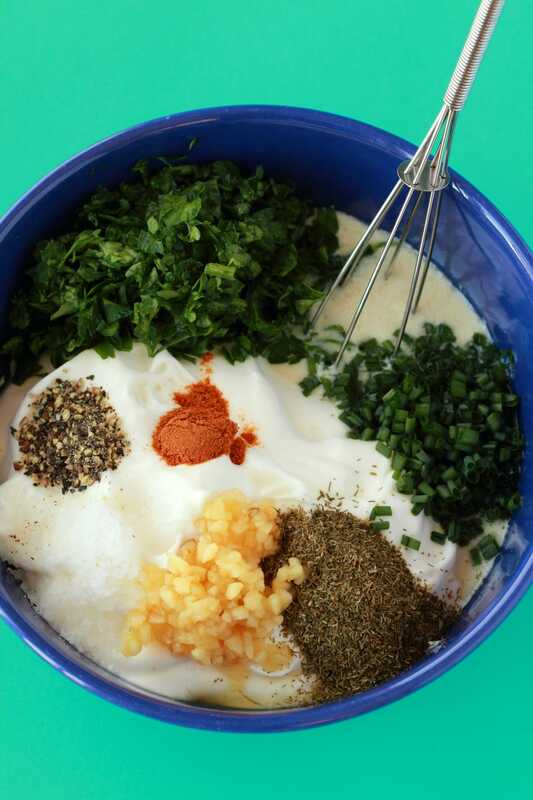 So for the vegan version we used a vegan mayonnaise and vegan buttermilk, made with some lemon juice and non-dairy milk, fresh herbs and flavorings. This was all that was needed for a totally delicious vegan ranch dressing. And really, no one would be able to tell the difference! 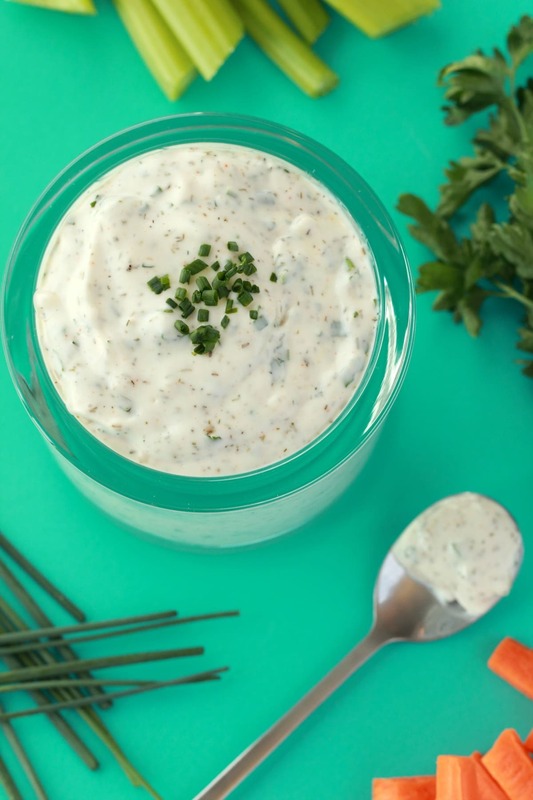 It’s a simple 10-ingredient recipe and the fresh herbs are some chopped parsley and chives and the dried herbs are some dried dill, which is something we fell in love with when we made our vegan tzatziki! Crushed garlic, sea salt, black pepper, a little cayenne pepper, and some white vinegar round the flavors out to perfection and you have a dressing that you will just want to use on everything! Able to turn raw veggies into a gourmet treat! Keep it in an airtight jar in the fridge and consume within a few days. 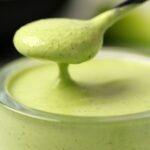 More Vegan Salad Dressing Recipes! 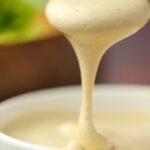 Our tahini salad dressing is divine poured over anything and everything and our vegan caesar dressing is of course wonderful on a vegan caesar salad! 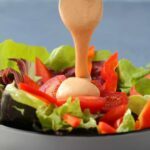 Our vegan thousand island is divine on a salad or as a topping and if you want to make your own vegan mayonnaise, our recipe is wonderfully tangy and perfect to use as a salad dressing too. And then let’s not forget the vegan aioli and vegan cashew cream these are also great options when you want a dollop of something to put on top of a salad! 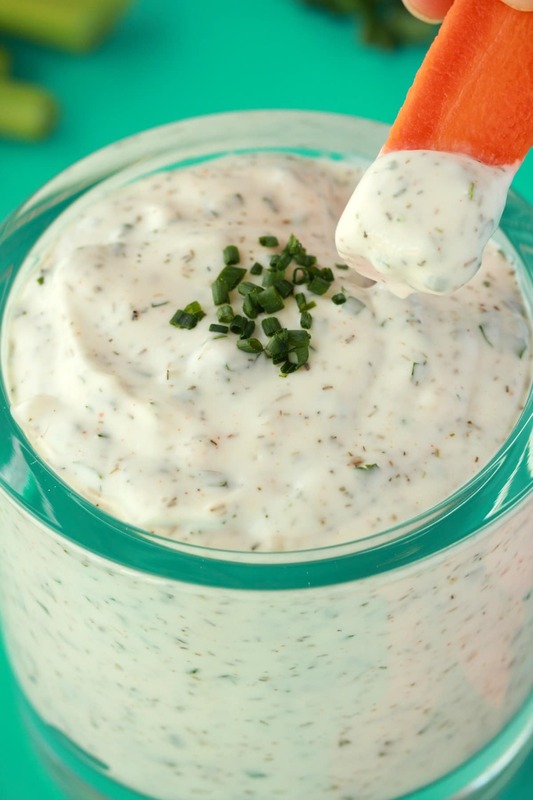 What do you think of this homemade vegan ranch dressing? Let us know in the comments and please also rate the recipe when you do! Thank you! Squeeze some lemon juice and add 1 tsp to a measuring jug and then add soy milk up to the 1/4 cup line and mix it up. It will curdle into buttermilk. Add it in to the bowl with the mayonnaise. Add the dried dill, fresh chopped parsley, chives, crushed garlic, sea salt, black pepper, cayenne pepper and white vinegar and mix everything in together. Serve with fresh chopped vegetables or chips as a dip, over salads as a dressing, or as a spread on sandwiches and inside wraps. 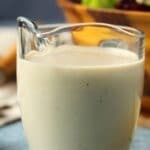 *You can switch soy milk for almond milk when making the vegan buttermilk if you prefer. *White vinegar is really the winning ticket here, you really won’t believe how much flavor it creates! If you want to switch this for apple cider vinegar you can go ahead, but flavor wise, white vinegar is really the winner. 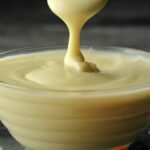 Vegan Mayonnaise, Creamy and Tangy – with Aquafaba! This is was great! I would suggest letting it sit in the fridge for an hour before serving just to let the flavors bend together. Overnight is even better! I grated the garlic instead of crushing it. I also used 1 tsp of dill paste instead. It gave it a subtle dill favor which was good because both my husband and I are not huge dill fans. I’m thinking I’m going to make this dressing with cilantro paste instead of dill and use it on a salad with chopped romaine hearts, cherry tomatoes, cucumbers and green onions. I get the seasoning pastes (cilantro & dill) at Walmart, they’re made by Trudeau. What I like about this dressing besides the taste is unlike many vegan, creamy type dressing recipes this one does not use cashews which are so expensive. This is our favourite ranch recipe. It’s so good. Definitely recommend. Hi! 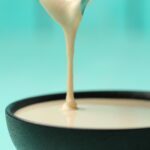 I would like to know if you used sweetened or unsweetened soy milk for the recipe? I used a regular sweetened one but you could use either sweetened or unsweetened.